Seb was indeed the pre-weekend favourite, but part by accident (literally) and part design he then flew under the radar. He didn't set a representative flying laptime in second practice due in part to a prang, while in the second part of qualifying he relented before the line on his final effort. And, in that way of his, he blitzed them when it mattered. It wasn't even close in the end, as pole was his by a clear third of a second. And this time it really mattered, as his title rival Lewis Hamilton was shy of the Red Bulls as well as Seb's stable mate Kimi Raikkonen, and starts fifth. It's an appropriate place for a crunch, as this is among the very most vital quali sessions of the year. Only at Monaco is passing tougher. Seven of the last eight pole-sitters here have proceeded to win. "I love this track. The car was tricky but was getting better, better and better. So pleased we got it done. "I need to calm down. It's an amazing track when you feel the car was coming together. I knew we had it in us but we had to get there." So where did the pace come from? "I don't know!," Seb conceded. He admitted also going slightly over the edge on his final run. "I hit the wall badly but I had to go for it." 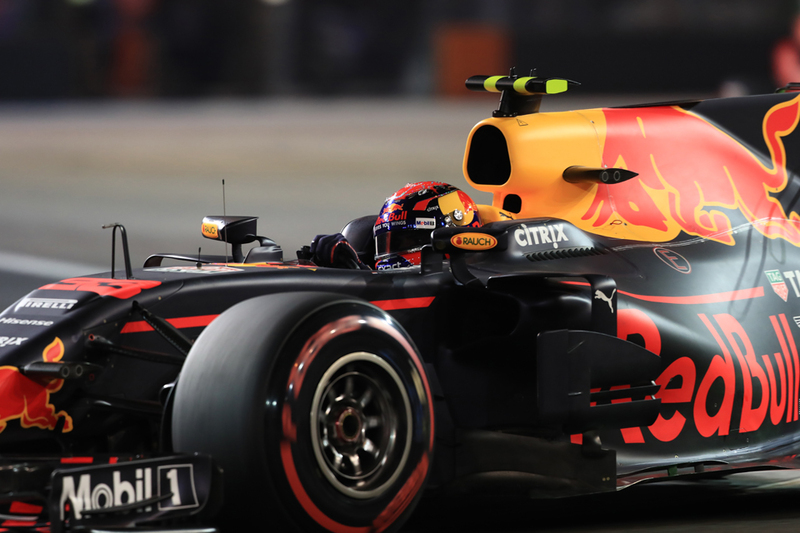 There was little between the Red Bull drivers throughout and that's how it ended up, with Max Verstappen in second a couple of hundredths quicker than Daniel Ricciardo in third. "It is [promising]," said Max. "Shame we couldn't put it on pole. The final lap was not great." Lewis was something like his formidable best but couldn't make up for the Mercedes's shortcomings at this outlying circuit, that has long flummoxed the silver team. "It's what we expected," said team boss Toto Wolff. "It's realistically where we are in Singapore." Hamilton expanded on the matter. 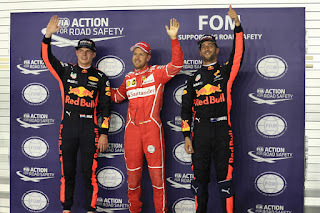 "We knew today would be tough but I didn't anticipate Ferrari would be as strong as they were," he said. 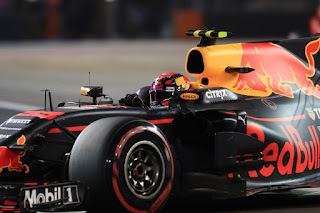 "I thought Red Bull would be as quick as they were. "I got everything I could out of the car. I gave it everything and more. I threw the sink at it and squeezed every bit of it." 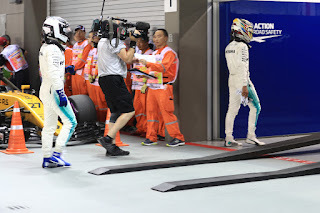 The other Merc of Valtteri Bottas wasn't even close to Lewis, eight tenths off and hasn't appeared to have got it together this weekend; he admitted to rather chasing his tail on the set up. He'll start sixth. The McLarens - on the weekend that the end of the team's difficult Honda marriage was confirmed - have spent much of the Singapore running nipping at the heels of the big three teams. As usual though it sank a little in qualifying (for the same reasons as Red Bull expect in extremis), but still looked good for best of the rest on the fourth row. 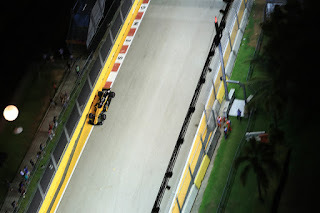 That was until Nico Hulkenberg pipped them to seventh at the last with another brilliant performance. 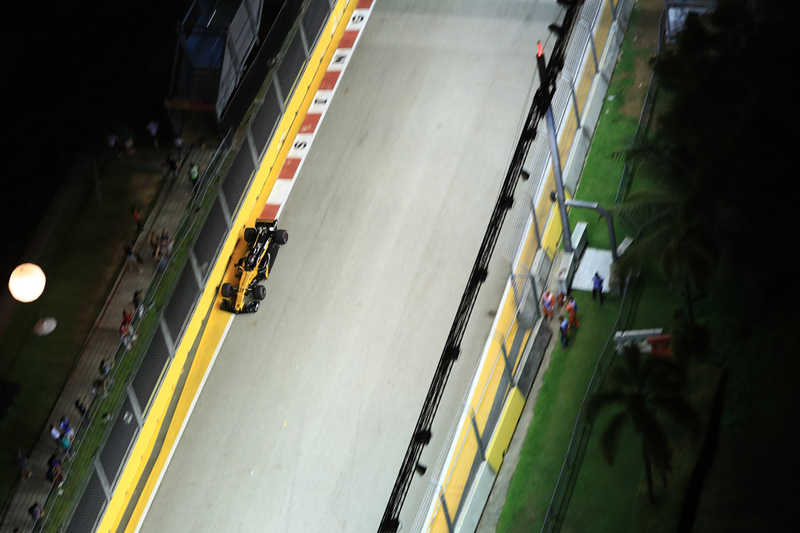 Fernando Alonso is the lead McLaren in eighth. The Red Bulls will be mighty in the race. As outlined, aside from when in extreme quali trim it's looked the quickest thing out there and its tyre handling over a race stint usually is the best too. "I will accept a little bit of defeat [today] but I'm still confident we will get victory," Ricciardo said afterwards on that very subject. "I think we've got a good package, I'm looking forward to tomorrow." Seb concurred indeed. "Tomorrow is a long race and these guys [the Red Bulls] are very quick," he admitted. "It will be a very close race." Overtaking isn't on the agenda here but by starting second and third the Bulls have the opportunity to make a strategy pincer movement on Seb. Pirelli predicts a two-stopper, which would give two opportunities to do so. 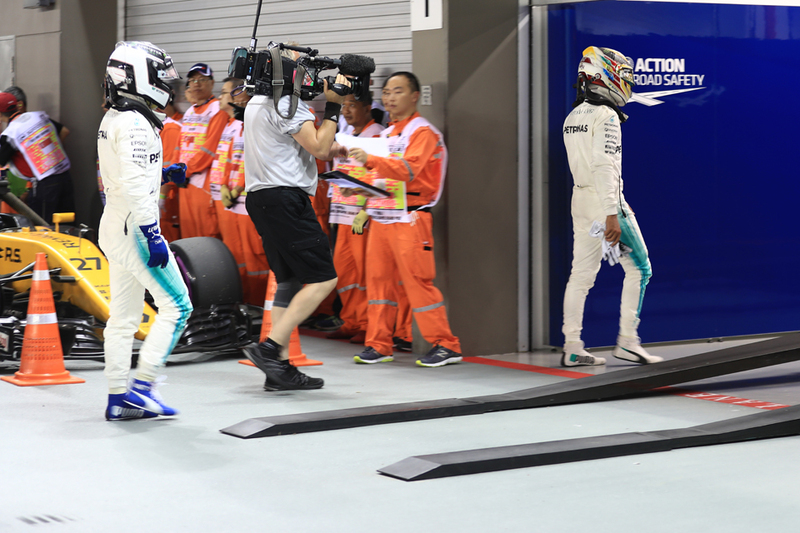 "This is a crap track for overtaking," Lewis added. "It's usually a long long train." But extracting Seb from the lead of a motor race never is easy. Particularly here, as he's won here four times - three from pole.